Widely regarded as one of the world's best tight-heads, Carl Hayman became the 1000th All Black when he made his debut as a replacement against Samoa in 2001. Having graduated through the ranks with Otago and the Highlanders, Hayman's early years at international level were characterised by sporadic appearances from the bench. It was only in 2004 following a superb Super 12 that he laid claim to a starting berth with the All Blacks, finding favour with new coach Graham Henry. In 2005 he also represented the New Zealand Maori, playing a big role in a famous win over the touring British & Irish Lions. At 6'4'' Hayman is not a classical prop, but his immense power in the loose and scrummaging prowess soon saw him rise to the top of the world game. 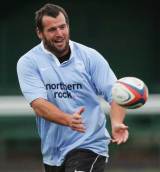 Following the 2007 World Cup, Hayman made the switch to Guinness Premiership side Newcastle, reportedly becoming the best paid player in the world game. Named as the Falcons' captain in 2009, Hayman was earmarked in many quarters as a certainty for the All Blacks' assault on the World Cup on home soil in 2011. Nevertheless, he opted instead for a contract with Toulon in France, joining former Falcons Jonny Wilkinson and Tom May at the Stade Mayol.